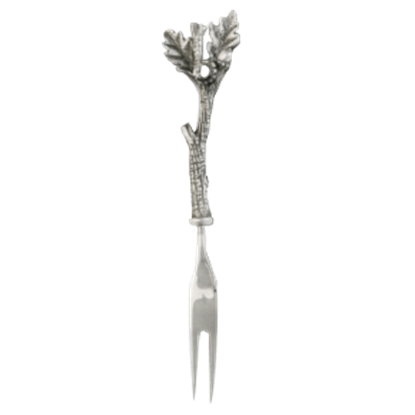 Capturing the appeal of the woods is no challenge, not when you have such a great array of accents to choose from here in the Majestic Forest Fine Dining Collection! 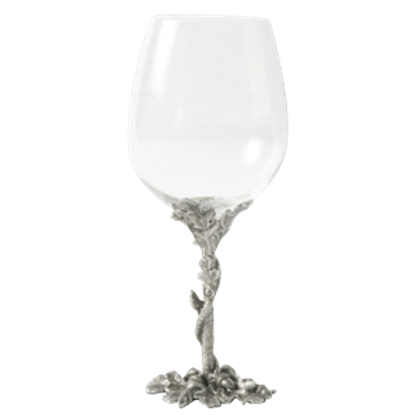 These pieces all emulate the lovely look of nature, allowing you to give your table and your dining room an infusion of beauty that is most often only found in the woods! This section is filled to the brim with elegant accents that are perfect for your dining room table, ranging from tall pitchers that are great for holding water, tea, or other refreshing drinks to traditional serving trays that you can use to transport and serve your delectable dishes. 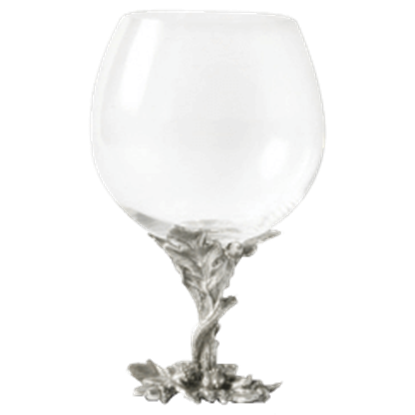 Whether you look at a tray, a charger, a glass, a serving bowl, or a candelabra, though, you will assuredly see elements of the woods in each accent. Acorns stand in as decorations on larger pieces like carving boards and serving trays, while also acting as salt and pepper shakers or measuring spoons. 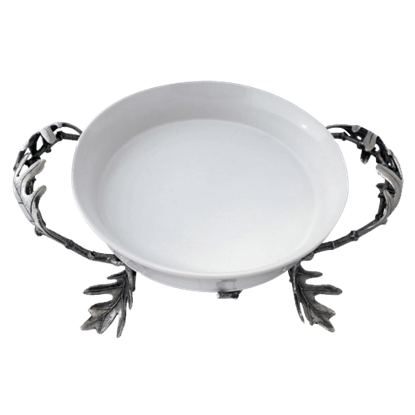 Leaves furl and curl, creating fine serving dishes, gravy boats, and table bowls. 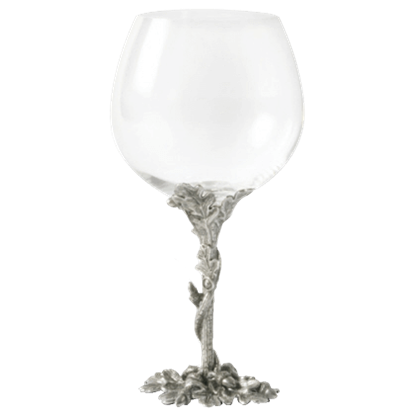 Shoots of simulated wood act as handles for cutlery, while twisting vines make up the stems of elegant wine and cocktail glasses. 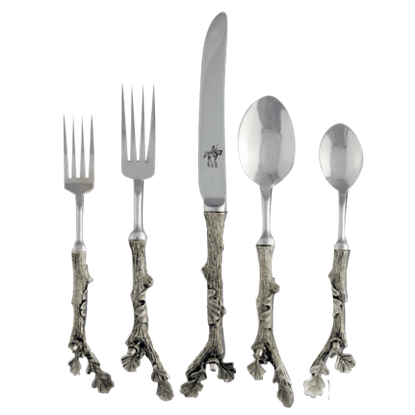 Pewter, steel, and handsome hardwoods all blend in this section, creating a collection of flatware and dinnerware that will leave your guests speechless. Bring nature to the table with some of the Majestic Forest Collection and you will not be disappointed. 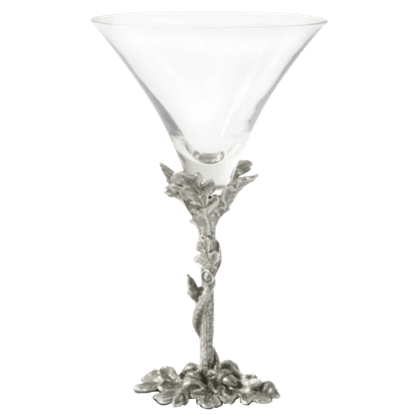 Add soft romantic lighting to your night time escapades with this pewter Acorn and Oak Leaf Candelabrum. 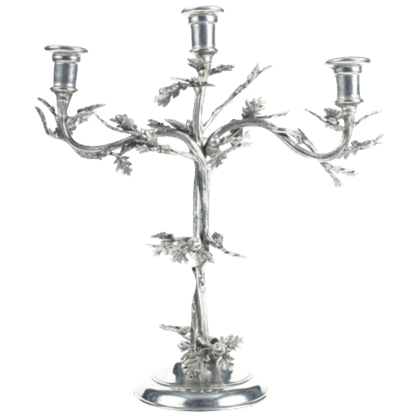 This nature-inspired candelabrum holds up to three taper candles that will add glowing light to your environs. 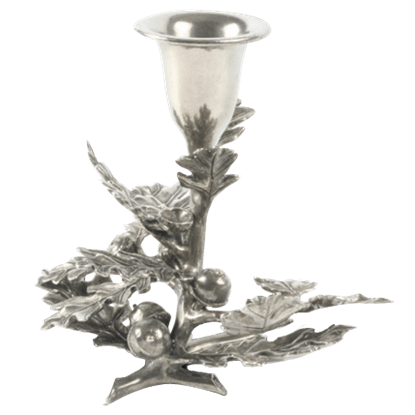 Elegant natural decor and soft romantic candlelight are readily on hand when you decorate with the Acorn and Oak Leaf Candlestick Holder. 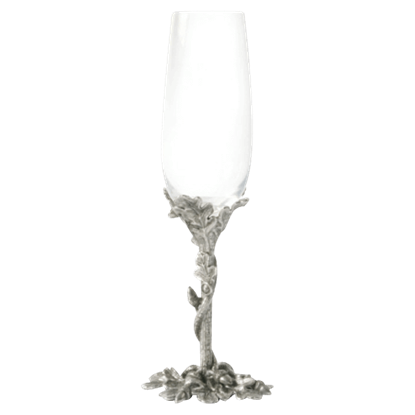 Illuminate an enchanting dinner or a festive evening with this attractive candleholder. 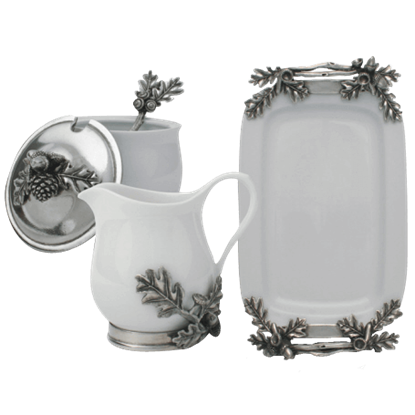 Wintry white stoneware, accented with elegant pewter oak leaves and acorns, creates a fine presentation of cream and sugar in the Acorn and Oak Leaf Creamer Set. 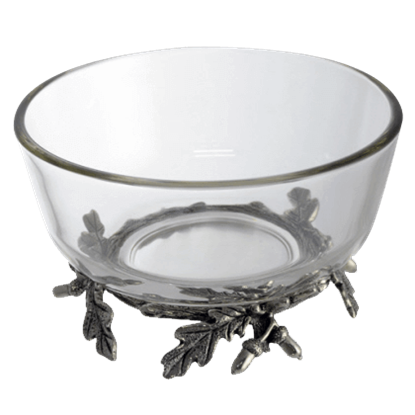 No gathering for tea or coffee is complete without this piece.